Read the label on a carton of half-and-half, and you'll likely be convinced that it is free of carbs. The reason for this is that only small servings of half-and-half are listed on the label. The more half-and-half you add to your diet, the more carbs you will add as well. Half-and-half is a light cream that consists of 10.5 to 18 percent milk fat, according to the U.S. Food and Drug Administration. Since it is a mixture of milk and cream, half-and-half provides carbs. The reason for the carb content is that all milk contains lactose, a type of sugar found almost exclusively in dairy products. Lactose accounts for all of the carbohydrates in half-and-half. Since half-and-half provides more fat that milk, it has slightly fewer carbs. You won't have to worry about the carbs in half-and-half if you simply use a tablespoon of it in your coffee each morning, as a 1-tbsp. serving provides less than 1 g of carbs. However, if you choose to use half-and-half extensively in an effort to curtail carbohydrates, be aware that each cup provides 10 g of carbohydrates, only 2 g less than a cup of nonfat milk. Each tablespoon of half-and-half adds 20 calories, less than half a gram of protein and approximately 2 g of fat to your diet. A cup of this light cream will add 315 calories, 7 g of protein and 28 g of fat, the majority of which is saturated. Since heavy cream is almost entirely fat by weight, it has fewer carbs than half-and-half. With less than 7 g of carbs per cup, it is clearly the low-carb choice. It may not be the best choice for your health, however, as 1 cup provides 821 calories and 88 g of fat. A mere tablespoon of heavy cream provides 52 calories and more than 3 g of saturated fat. Nonfat milk, on the other hand, provides 83 calories a cup and a negligible amount of fat. Since calories still count on a low-carb diet, choosing half-and-half or cream over milk can sabotage your diet. 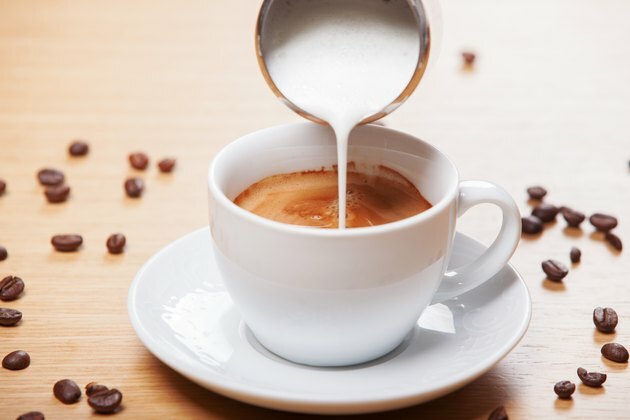 If you've been using half-and-half or cream instead of milk because you're concerned about carbohydrates, consider using unsweetened almond milk instead, which can have as few as 2 g of carbohydrates per 1-cup serving. Unsweetened soymilk has only 4 g per serving, and unsweetened coconut milk has even fewer with 1 g of carbohydrate per serving. If you are using half-and-half in relatively small amounts, simply switching to milk can save you calories without causing a carb overload.